Iraqi authorities said that Islamic State extremists have demolished the remains of the ancient city of Hatra in the north of the country, following a “bulldozing” of the ancient Assyrian city of Nimrud, also located close to Mosul. Employees of the Iraqi Ministry of Tourism and Antiquities have reported that the Hatra site, which has been on the UNESCO World Heritage list since 1987, was destroyed on Saturday, an official told Reuters. It is hard to estimate the damage, as no images of the demolition have been received so far. However, a local resident told Reuters that there was a powerful explosion early on Saturday, recalling other people’s reports that ISIS militants had already destroyed some of the larger constructions and were bulldozing others. The Islamic State militants began carrying away artifacts from Hatra on Thursday – before starting to destroy the city on Saturday, Saeed Mamuzini, a Kurdish official from Mosul, told AP. The remains of Hatra’s massive fortifications and temple complex dated back to between the first century BC and the second century AD, and the city, founded in the days of the Seleucid Empire, a large Hellenistic state, was about two kilometers in diameter. 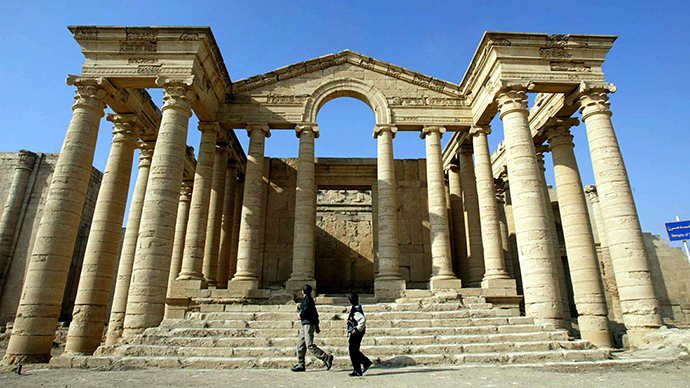 Hatra is located about 110km (68 miles) south-west of Mosul, which currently is the largest city controlled by ISIS. Earlier this week, Islamic State militants bulldozed the ruins of the Assyrian city of Nimrud, located nearby. The radical interpretation of Sunni Islam stands behind the vandalism of the terrorists that control large territories of Iraq and Syria, and it believes that shrines have to be razed to the ground. The birthplace of writing, mathematics and literature is being destroyed by #ISIS. #Mosul#Nimrud next #Hatrapic.twitter.com/tGgy2hHMf1"
A week ago, a video was released showing the militants raging in the museum of Mosul, smashing priceless Assyrian and Hellenistic statues and artifacts that date from the seventh century BC. According to the Antiquities Ministry, it is the lack of the actual international response to ISIS attacks on historic sites that has failed to prevent the group from sticking to this path. “The delay in international support for Iraq has encouraged terrorists to commit another crime of stealing and demolishing the remains of the city of Hatra,” its statement said, as cited by Reuters. In February, the jihadists blew up the Mosul Public Library using homemade bombs. The previous month, the militants took all the books from the Central Library of Mosul, leaving only Islamic texts. Last July, they destroyed the tomb of the prophet Jonah, also located in the seized city.